GRIZZY AND THE LEMMINGS- TELEPORTATION'S THE WAY TO GO! What to know: Wonderful animation, fun story, great message. Very well executed piece of animation. I would love to see other episodes of this series. It has a bit of gratuitous cartoon violence, but nothing replicable per se. 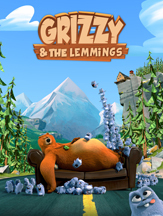 The storyline follows the antics of a greedy bear and a group of lemmings who seem to thwart his plans at every turn. It's bright, colorful, has good background music and is well constructed. The most interesting part is the ending which you will have to watch to find out what it entails. I recommend it for the KIDS FIRST! Film Festival, for ages 6 to 12 and give it 4 out of 5 stars. Reviewed by Julie S., KIDS FIRST! Adult Juror. As soon as the Forest Ranger is away, GRIZZY feels it's only natural that the Ranger Station becomes his territory. And no other animal dares to contest this privilege. Except the LEMMINGS! They are small, but there are a lot of them - and they want their share of the Eldorado! Grizzy finds two identical vases that are actually communicating vessels in a Native American Indian chest. If he sticks his hand in one, it comes out the other, regardless of the distance between them. This should satisfy Grizzy's natural lazy streak, unless the Lemmings realize the incredible games they could play with the magic vases. by Victor Moulin, graduate of Supinfocom in France.